Coahuila state Gov. Miguel Angel Riquelme said about 1,700 migrants arrived late Monday via 49 buses from the cities of Saltillo and Arteaga. The caravan was escorted by Mexican soldiers and police– in other words a coordinated, militarized invasion. They arrived Tuesday in the Mexican border city of Piedras Negras, just west of Eagle Pass, Texas. The “poor” migrants were given sleeping mats, blankets, food and wireless access. Child welfare officials reported there 46 unaccompanied youths aged between 15 and 17 in the caravan. The region where they are encamped has been controlled by the now-fragmented Zetas cartel, the Associated Press reports. Eagle Pass is along the Rio Grande area that has no border wall and nearly zero border security, although President Trump sent more U.S. troops to the border. Images from local media show U.S. agents with riot gear and shields standing on a bridge separating Eagle Pass and Piedras Negras. 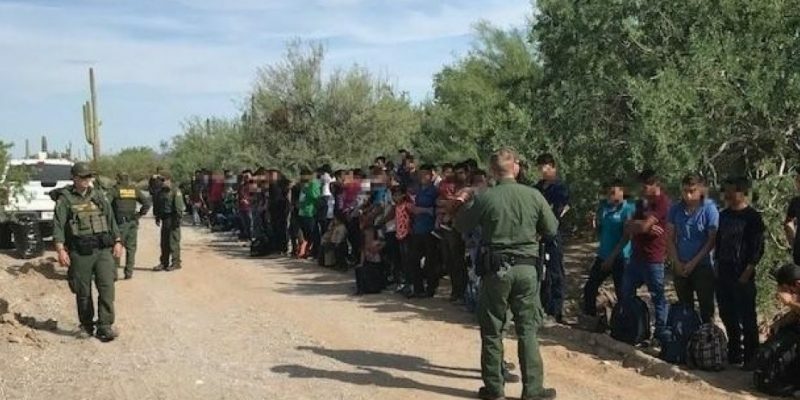 DHS said Border Patrol agents had already apprehended some migrants who crossed the border illegally overnight, the Associated Press reported. A U.N. refugee agency said Mexico had received 12,574 requests for humanitarian visas from Jan. 17-29, from migrants originating from Honduras, Guatemala and El Salvador. Of the 1,000 migrants interviewed, almost 30 percent said they wanted to reach the United States; 46 percent said they might stay in Mexico. Nearly one third were minors.